oh, my, are they good! 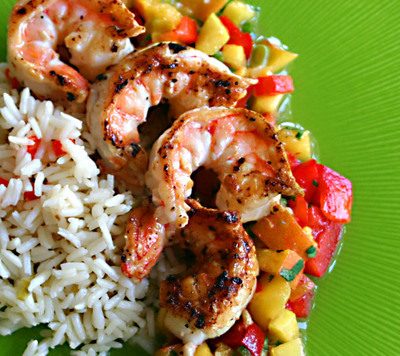 I love fresh salsa with fruit like this and those shrimp look delicious. There is absolutely nothing better than fresh shrimp (which of course we never get in New England) and fresh peaches (which only appear here in August). My mouth is watering! I’ve never been fond of Florida, but your Apalachicola adventures always make me feel so warm and sunny. Peachy, indeed! As for the fried chicken, did you use lard? Fresh juicy peaches are my personal heroin! Once the season kicks in I’m constantly wiping the sweet juice off my chin (My face often attracts flies in the summertime). I’m going to make this soon! Thanks! now this looks tasty! Is that grilled shrimp? Fabulous photo! Love the vibrant colors. I am lucky enough to have tasted those delicious Apalachicola shrimp but the combo with the fresh Georgia peaches is making me wish we didn’t decline the invitation to meet you there this weekend. Mary — what other fruit salsas do you make? I have been stuck in a pineapple rut, but this peach experience tells me it’s time to get out. Time for a road trip, Lydia! Lisa — I am not sure Apalach IS Florida. At least, so far it’s the Florida that time forgot. And no, I used peanut oil. What else do you do with peaches, Kevin? I bought, umm, a lot. They aren’t grilled, Matt. I sprinkled them with a little sugar and seared them in a nonstick pan with a drop or two of olive oil. It’s too easy for me to overcook them on the grill, so sometimes I just do this instead. It’s quicker too. Ronnie, it’s not too late. You can be here by beach time tomorrow, and we’re smoking our dinner right now.